Julian Abraham ‘Togar’ engages in extensive research resulting in analytically focused works, often combining installation, sound, music, programming and science. Abraham’s projects foster social engagement through community participation in workshops and instructional programs. The artist is concerned with the relationships and connections between art, the environment, science and technology. Key outcomes of Abraham’s projects are education and the dissemination of specialist scientific knowledge to the broader community. Chen Shaoxiong’s practice addressed the way information and images are controlled, manipulated and suppressed to maintain hegemonic structures and perpetuate ignorance. Originally trained in traditional Chinese ink painting techniques, Chen expanded his practice to include performance, video and participatory art. Growing up in an environment where access to information was highly regulated, Chen developed a heightened awareness of history as narrative and its capacity to be misused or misinterpreted. For Chen, history was neither a stable nor a static concept, but a construct easily susceptible to distortion. Geng Xue works predominantly across sculpture and ceramics, with a focus on the material qualities of porcelain. Extending her practice beyond the conventional boundaries of sculpture, Geng Xue’s short films and poetic video works explore a fascination with aestheticism and her love of traditional Chinese culture. The fictional narratives Geng Xue creates are imbued with romanticism and emotion; imaginary worlds where delicate porcelain figurines and realistic clay sculptures are brought to life. Inspired by urban landscapes, Tanya Goel transforms the chaos of everyday life into orderly, precise paintings informed by her interest in the relationship between light, colour and material. Representing an archaeology of the metropolitan environment, Goel’s canvases are records composed of pigments sourced from unexpected places; city streets, construction zones and building sites. The artist collects pieces of limestone, glass, cement and brick, crushing the samples to chemically analyse and examine their basic tonal elements before extracting the pigments to create her paintings; transposing her conclusions onto canvas. Chia-Wei Hsu applies narrative convention as a language through which to re-present history, myth and legend. In doing so, Hsu acknowledges the gulf between the past and the present, and the impossibility of completely accurate reinterpretation. Melding notions of objective and subjective reality, Hsu creates films that occupy a space somewhere between the two. Referencing geographical, historical and cultural regions in Asia, Hsu’s works are localised attempts at dealing with forgotten or neglected stories from the distanced perspective of the present-day. Video and performance artist Ami Inoue draws on personal stories from an ethnographical perspective, producing works that reveal the gulf between modern life and a ‘primitive’ means of survival. Inoue learnt to hunt while still in graduate school and now documents her methods from the position of a hunter who lives in the city. 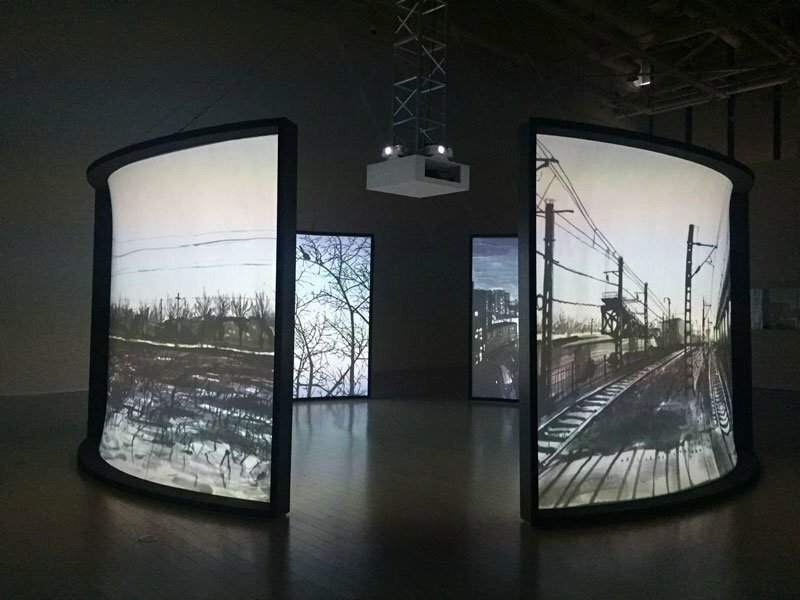 Her videos often feature tranquil images of nature contrasted with clinical urban scenes, suggesting the contemporary disaffection between the natural and human-made worlds. Sosa Joseph’s paintings exist in the indeterminate space between reality and fantasy, drawing inspiration from every day, commonplace activities and reproducing them in evocative ways. Joseph presents the real and the imagined as deeply related and ultimately indivisible, despite the two being commonly perceived as opposing forces. Whilst referring to the social and cultural context of her native Kerala, the allegorical quality of Joseph’s works render them universally relevant through a broader appeal to our shared human experience. Prabhavathi Meppayil’s process-oriented practice is motivated by traditional craft and an appreciation of the simplicity and purity of objects and materials. Influenced by her family’s long history working as goldsmiths, the artist often reinterprets and repurposes artisanal techniques, tools and resources in her work. Displacing the intended use of certain materials or objects, Meppayil repositions the items to align with forms and ideas associated with post-war minimalist art, examining modernist notions of abstraction juxtaposed with artistry, craft and tradition. Establishing her artistic career after relocating to São Paulo in 1936, Tomie Ohtake’s painting practice focused on the fundamental elements of composition. Exploring colour, form, texture, tone and gesture, her works examined the visual potential of the basic components of painting. By means of careful selection and deliberate omission, Ohtake displayed a discerning capacity to recognise the force and potency of pictorial restraint. Working with hardwood, slate, organic fibre and metals, Puntusawasdi’s three-dimensional architectural sculptures promote a heightened awareness of space, encouraging the viewer to acknowledge the spatial field surrounding an object as an intrinsic part of the work. His shelter-like sculptures also question concepts of reality, provoking considerations of subjectivity and alternative states of being, echoing a fundamentally Buddhist world-view. Established in 2010 by the Cambodian art collective Stiev Selapak as a space for diverse and experimental art practices, Sa Sa Art Projects is the only not-for-profit artist-run space in Phnom Penh. The space is located in the White Building (originally known as the Municipal Apartments), a historic apartment complex designed to accommodate the tripling of Phnom Penh's population that occurred between 1953 and 1970. Sa Sa Art Projects is an experimental mechanism constantly evolving and adapting to the needs of the community while fostering opportunities for creativity and collaboration. Born in Cambodia during a time of hostility and political upheaval, Svay Sareth began making art as a teenager while living in a refugee camp located near the Thai-Cambodian border. Svay works across the mediums of sculpture, installation, and durational performance to examine the many facets of war: violence, power, fear, resistance, futility, loss and survival. After living through civil war and the aftermath of terrible conflict, making art became a way for Svay to document the violence of everyday life, and a means to escape reality and dream of a better world. Akira Takayama creates and directs projects that challenge the conventions of traditional theatre, expanding the audience experience through participation and experimental and theoretical considerations. In 2002 Takayama founded Port B, a project-specific theatre collective aimed at fostering collaborative relationships and artistic interventions, including installations in urban spaces, tour-performances, experimental social projects, lecture performances and sight-seeing tours. Motifs of movement, migration, participatory theatre, and the use of a radio transistor and maps, are common tropes in Takayama’s works, which explore both how theatre can be a touristic tool and how tourism might act as a medium for theatre. Maria Taniguchi’s practice encompasses a diverse range of mediums including sculpture, painting, drawing, silkscreen, video and photography. Interested in exploring concepts of space and time, in 2008 Taniguchi initiated an ongoing series of paintings; large-format canvases composed of a seemingly endless number of hand-painted bricks. The artist has referred to these process-driven, meditative works as being the fundamental root of her artistic practice which, at its core, explores the systems and structures of making art and the materiality and architecture of painting itself. Su-Mei Tse’s practice combines photography, video, installation, and sculpture. A classically trained cellist, Tse grew up in a culturally diverse and musically rich environment as the daughter of a Chinese violinist father and a British pianist mother. Informed by her background, Tse creates humorous, conceptually rigorous works that employ musical associations, sound and rhythm as lyrical constructs through she investigates the way visual acuity and auditory sensitivity can influence our perception of the world around us. Formally trained in philosophy and composition, Samson Young‘s artistic practice centres upon the representation and re-interpretation of lost or overlooked events of socio-political and personal significance. Young’s emotive multimedia works investigate the complex interplay between identity and conflict, without imposing solutions or halting productive dialogue. Young’s process is deeply invested in meticulous research which often involves gathering ‘sound sketches’ and recordings that become the foundation of works that challenge accepted notions of time and place. ABOUT THE BIENNALE OF SYDNEY: Since its inception in 1973, the Biennale of Sydney has provided a platform for art and encounters, showcasing the work of nearly 1,800 artists from more than 100 countries. Today it is considered one of the leading international art events, recognised for commissioning and presenting innovative, thought provoking art from Australia and around the world. In 2016, the 20th Biennale of Sydney attracted more than 643,000 visits. With an average 40 per cent of visits made by people from outside of Sydney, the Biennale holds an important place on both the national and international stage. Entry to the Biennale of Sydney is free to the public. Planning on travelling to Sydney for the Biennale? It’s a great time of year to experience one of the world’s most spectacular cities. Sydney enjoys a mild climate between March and June. To gain the most from your visit we suggest planning to Spend four to five days in Sydney. Sydney is also a gateway to visiting Australia and the Asia-Pacific Region. After visiting the Biennale take off and enjoy magnificent coastline, mountain and deserts, as well some of the most significant arts and cultural precincts in the world. For interstate and international travelers, we recommend staying with our Accommodation Partner, The Old Clare Hotel: theoldclarehotel.com.au. TWT Property Group Pty Ltd is delighted to announce their support as Principal Partner of the Biennale of Sydney, the longest running and most respected contemporary art event in Australasia.